Summer has been HOT! 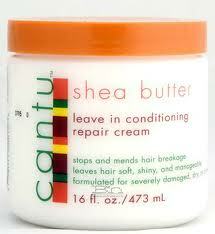 My hair was on life support and a real "hot mess" until I began using Cantu Shea Butter leave-in conditioner. The moisture and manageability to my hair is amazing! I know that this isn't a new product but I never used it before. It has been added to my must have list, so Ive decided to share with my readers. Yay! I am having a giveaway...the prize will be a full jar of Cantu Shea Butter & a few surprise hair goodies... How do you win you say? Well its simple.. I am always looking for a new leave in conditioner. Seeing how I literally just had a baby, I know I am going to have some hot mess hair style days so please hook me up with hot mess recovery! My hair is super thick and super DRY!!! And the summer heat only adds to the hair frustration! I need something to bring the life back to my malnourished tresses so my strands wont snap like twigs! You already know I am a fan on FB and a follower on Twitter!